If you have a multi-million dollar trust fund, this article is not for you. You have deep pockets and can afford to buy your way into any fantasy football tournament you choose, regardless of the entry fee. The rest of us need an alternative. For us, daily fantasy is like an accountant’s ledger. Some contests go in the “win” column. Some go in the “lose” column. At the end of the week, we hope our winnings outstrip our losses. While we might be willing to pony up a $300 buy-in for a GPP tournament with $500,000 at stake, we’re only going to do so on occasion (if ever). The stakes are just too high. That’s where fantasy football qualifiers and satellites come in. They give you a way to compete in contests that might otherwise be too expensive to join. Below, I’ll explain what qualifiers and satellites are and describe how they work. We’ll also cover a step-by-step system for making the best use of them in fantasy football at DraftKings. Lastly, I’ll give you a few simple tips for managing your bankroll while competing in qualifiers and satellites. A qualifier is a contest that awards the winner a ticket to another event, typically one with a larger buy-in or an exclusive contest for which there is no buy-in. For example, DraftKings is hosting a $15 Million Fantasy Football World Championship this year. The grand finale will be held live in Los Angeles where 200 team owners will compete against one another for a chunk of the prize pool. The first-place winner will receive $5 million. The person who finishes last will receive $20,000. The only way to gain entry to that event is to enter and win a qualifier. DraftKings will be hosting 200 qualifiers in Las Vegas during week 15. Each one will produce a single winner who will go on to compete in Los Angeles. In other words, you can’t buy your way into the finale. Satellites are similar to qualifiers. They give the winner – or winners – entry into more expensive contests. One of the differences is that you’ll typically see satellites at the lower-stakes end of the chain. Let’s use DraftKings $15 Million NFL Championship as an example. DraftKings will be running hundreds of satellites between weeks 1 and 14 (see this weeks here). Each of those events will produce one or more winners who will receive tickets to higher buy-in events. Many of those latter events will award winners with vouchers to the week 15 qualifiers. The qualifiers, as mentioned above, will feed into the grand finale. Let’s assume you’re interested in entering fantasy NFL qualifiers and satellites (I’ll refer to them as Q&Ss going forward). How do you get started? Read on for a simple step-by-step approach. Leap into this NFL Season prepared to win! Before I show you how to get involved with Q&Ss, it’s important that you have the right expectations. These contests are tough to win. Why? First, they tend to attract a lot of experienced and savvy DFS players. These are guys (and gals) who have been cutting their teeth on fantasy football for years and have developed tried-and-true draft strategies. They’re the ones you’ll be competing against for a limited number of tickets. The second reason is because there are only a few winners from each contest. Often, there’s just a single winner. For example, I’m currently looking at a 188-player Week-2 Millionaire Maker Supersatellite at DraftKings. The entry fee is $5. 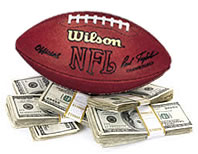 Each of the winners will receive a ticket to an NFL $20 Millionaire Maker event. Compare that payout structure to a 50/50 where half of the entrants win. I’m not trying to discourage you from entering these types of contests. Rather, I want you to be prepared. When you join qualifiers and satellites, it’s important to keep in mind that your chances of winning are small. That said, there are exceptions. A few large-field “super satellites” award as many as 1,000 entrants with tickets to higher buy-in events. But those types of contests are in the minority. With that out of the way, here’s a quick guide for competing in fantasy football qualifiers and satellites at DraftKings. If you’re entering Q&Ss, you’re doing so as part of a grander scheme. No one enters these types of contests for the sole joy of winning tickets. They do it to gain entry to more expensive events, usually those with large prize pools, that can lead to big winnings later. Runners-up sometimes receive cash prizes in qualifiers. But those prizes aren’t a big motivator since the contests are so tough to win. There are easier ways to score a payout, such as competing in 50/50s. So it’s important to have a plan in mind. Let’s say you’re trying to lock down a spot in one of the 200 qualifiers DraftKings will be hosting during week 15 of its $15 Million NFL Championship. You have a long haul with a lot of steps ahead of you. It’s a good idea to map out a plan to keep you on course. Depending on your plan of attack, you may be able to skip one or more steps toward reaching your end goal. Although doing so may cost you a few extra dollars, it might be worth it. For example, suppose you want to compete in DraftKings’ NFL $50,000 Blitz. The entry fee is $300. You’ll compete against 184 other DFS players for a piece of the guaranteed $50K prize pool. The only issue is that you don’t want to pay $300 to enter. That’s too rich. First, you’ll enter a Week-2 Millionaire Maker Super Satellite. The buy-in is only $3. The top 250 finishers will receive a $20 ticket, good for a later event. Ever-confident, you intend to be one of those 250. Although you’ll be competing against 1,915 other team owners, you like your chances. Second, you’ll take the $20 ticket and enter an NFL $300 Ticket Satellite. With only 17 entrants allowed to join, you’ll be competing against a much smaller field. To that end, only 1 team owner will receive the $300 ticket. You’re confident you’ll win. Third, assuming step 1 and 2 go according to plan, you’ll take the $300 ticket and enter the NFL $50,000 Blitz. Rather than having to pay the event’s $300 buy-in, you’ll have gained entry for only $3, the amount you spent to enter the Week-2 Millionaire Maker Super Satellite. Skip the Week-2 Millionaire Maker Super Satellite. Instead, spend the $20 needed to enter the NFL $300 Ticket Satellite. From there, assuming you win, you can progress straight to the Blitz. You don’t have to mess around with the $3 Super Satellite. You’ll save time and avoid the hassle of competing at the lowest end of the food chain. Of course, that alternative assumes you have a little extra cash to risk. If you’re playing with a very small bankroll, you’re better off grinding your way up from the lower end of the chain. Most qualifiers and satellites allow you to draft multiple lineups. It’s usually a good idea to do so, especially if you notice the field is filled with new and inexperienced players. Each additional roster you create increases your chances of winning a ticket to the next event. If you’re playing in a super satellite, you could conceivably walk away with multiple tickets, dramatically improving your odds. Let’s say you enter a satellite and notice the field is filled with a lot of experienced DFS players. You know for a fact that many of them have great track records for winning fantasy football contests. That changes things. Unless you have just as much experience as they do, creating multiple rosters might entail putting too much of your bankroll at risk. After all, your odds of winning will be much smaller against that crowd. As a rule, you should create multiple lineups. Just be wary of shark-infested waters. I’ve given you a lot of actionable fantasy football draft tips in past articles. Some are designed to help you cash in large-field tournaments. Others are better suited for smaller-field cash games where a greater percentage of the field earns a payout. Competing in qualifiers and satellites is a lot like competing in large-field tournaments. Only a small percentage of the field will receive vouchers to other events. It doesn’t matter whether the contest allows 4,600 players to enter or 23 players. The payout structure is incredibly top-heavy. That means you’ll need to take bigger risks. It’s the only way you can hope to break out from the pack. To that end, you’ll need to use the same draft strategy you’d use when competing in a typical large-field guaranteed prize pool tournament. Now, let’s end with a couple tips regarding bankroll management. The most important thing you can do is to track your buy-ins, winnings and losses. That may seem obvious. But you’d be surprised by how many DFS players fail to monitor those three simple stats. Instead, they enter a string of contests, win some, lose some and then wonder why their bankroll is shrinking. Then, use a simple formula to automatically calculate a running profit/loss total for the month. If you neglect to track your results, it’ll become too easy to focus on your wins and lose track of your losses, especially if you’re playing at more than one DFS site. Another important tip: limit the percentage of your bankroll that you allocate to qualifiers and satellites. In a recent article, I recommended that you spend 80% of your bankroll on cash games and 20% on large-field tournaments. The amount you spend on Q&Ss should come out of that latter 20%. To summarize, qualifiers and satellites are not for beginners. They’re tough to win. But if you know what you’re doing and have had success competing in fantasy football contests, you can leverage them to gain entry into more costly events. And that can put you within a breath of winning a life-changing payout! Visit DraftKings today to check out their long list of fantasy NFL qualifiers and satellites. The action is already heating up. Now’s the time to create and implement a plan of attack that allows you to make the most of it. If you don’t yet have an account at Fanduel, register with the special promo code “FREAK.” Lock in a 100% deposit bonus on your 1st deposit.